Description: NS 11A heads west with a pumpkin and a switcher lending power. Description: NS Southbound Roadrailer 251 at Mableton, Ga. Description: NS Southbound Triple Crown Road Railer 251 ( Sandusky, Ohio to Jacksonville, Fl. ) passing through Mableton, Ga. Description: An ex-CR C40-8W and an ex-SP SD40T-2 lead the 14G (PIMO) past the energy plant (which would be to your right if it were in sight). Description: Unusual combo of fallen flag units from Conrail and Southern Pacific power NS manifest east on 2 at milepost 35.5 of the Harrisburg Line by the nuclear power plant at Limerick. Description: NS 69J has just cut off its head-end helpers and one set of rear helpers. 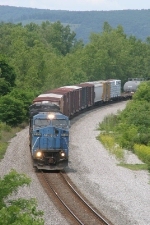 The second unit is a BNSF SD70MAC in the green and cream paint scheme. A set of helpers will stay on the rear to help hold this steel slab train back on its descent down the west slope. Description: WB TOFC, 13th Avenue, 0752 hours. Description: Note the grain sprouting on the hopper in the foregound. Description: Note the grain sprouting on the hopper at lower right. Description: NS 24Z would get take the siding at CP 51 and wait for NS 19G and NS 21M to head west before 24Z would continue east. 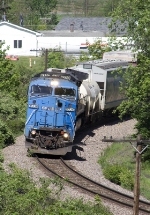 Description: Two Conrail units that are now unusual: A non-Quality C40-8W and an SD70. Description: Ex CR 8336 showing some wear and laying over at Port Kennedy in Valley Forge Park on a loaded hopper train. Loaded hopper trains are staged here on track 2, sometimes for days, before proceeding to the power plants.